As the threat of catastrophic climate change looms, there’s never been a more important time to teach our children about the importance of protecting our environment – however a new Toys R Us ad blatantly disses the environment in favor of consuming plastic toys. The ad, which was created by PR company The Escape Pod, depicts children on their way to a field trip in the forest. The bus and tour leader are disguised as “Meet the Trees Foundation” ambassadors, only to later reveal that the kids are instead being taken to a Toys “R” Us store to play with the merchandise. The children cheer screams of joy after the line, “But we’re not going to the forest today, we’re going to Toys “R” Us, guys!” It’s bad enough that Toys R Us has built a business around cheap plastic junk mass produced in other countries – but did they really have to take a such a blatant swing at those of us who care about the environment, in order to sell them? The sight of children playing among the neon colors and toxic plastics inside a warehouse is enough to make any concerned parent cringe. Toys “R” Us apparently feels it is necessary to compete with the natural environment so much that they are willing to fashion a PR campaign that implies that all kids really want is something they can purchase. Of course, this is absurd. Anyone who has children can tell you they naturally love being outdoors and would generally prefer sticks, leaves and rocks to play with over plastic crap made in China. Focused solely on profit, the toy giant may be unaware of the substantial amount of research that links outdoor play with improved scores in math and science, weight management, psychological well being, and mastery of social skills. Instead, they would prefer to cast nature in a poor light so that they can sell more products, fuel the idea that consumerism is a viable way to achieve true happiness, and that children and their impulse desires should dictate they way they are raised. What do you think about their latest campaign? Tell Toys “R” Us what you think on their Facebook page. As the threat of catastrophic climate change looms, there�s never been a more important time to teach our children about the importance of protecting our environment - however a new Toys R Us ad blatantly disses the environment in favor of consuming plastic toys. The ad, which was created by PR company The Escape Pod, depicts children on their way to a field trip in the forest. 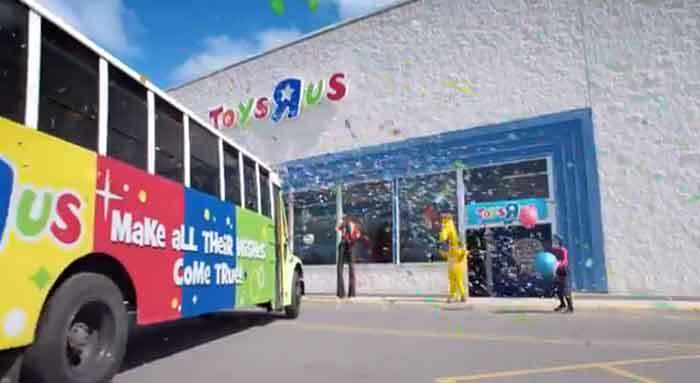 The bus and tour leader are disguised as "Meet the Trees Foundation" ambassadors, only to later reveal that the kids are instead being taken to a Toys "R" Us store to play with the merchandise. The children cheer screams of joy after the line, "But we're not going to the forest today, we're going to Toys "R" Us, guys!" It�s bad enough that Toys R Us has built a business around cheap plastic junk mass produced in other countries - but did they really have to take a such a blatant swing at those of us who care about the environment, in order to sell them?